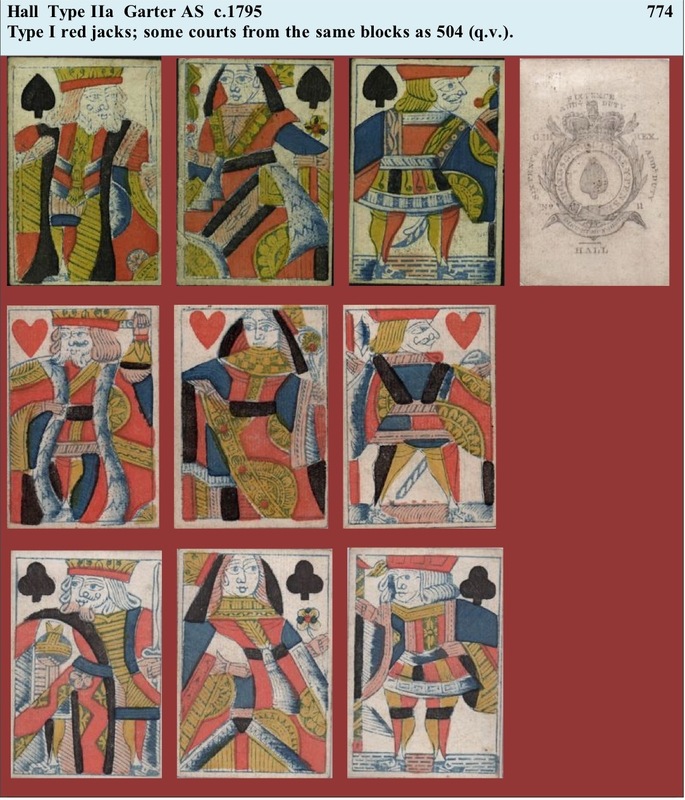 A fairly early example from this maker: these courts are basically the same as Llewellyn's (see page 30), but with Type II eyes rather than Type I. And three more examples, two of which have the wrong AS. 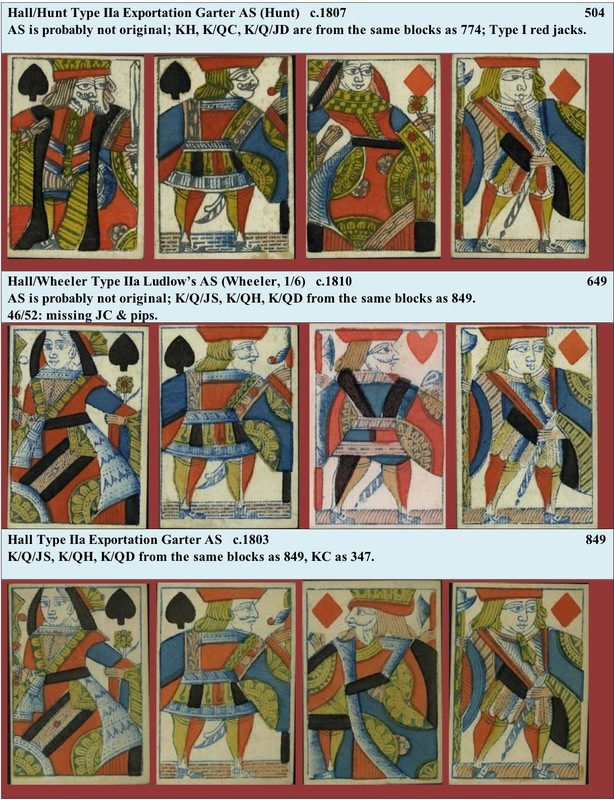 Later packs had a simplified, somewhat cruder version of the Type II courts. In around 1823 Hall was joined by Bancks and a new set of courts (HB2), which have some resemblance to the redrawn courts of Hunt (HB1; see previous page), were produced. For a while after the new firm was set up Hall & Son cards can be found in Hall & Bancks wrappers. HB2 continued into the Old Frizzle period. Following the amalgamation with Hunt in c.1840, HB2 eventually disappeared and HB1 continued to be used in Bancks Brothers packs from 1849. Although we have seen that Bancks Brothers dwindled fairly rapidly in the 1850s, they did try some updating of their cards. 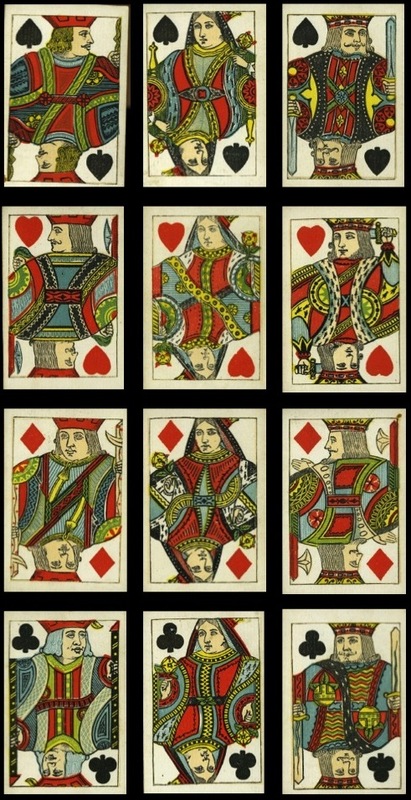 As far as I'm aware, they were the first to produce a pack with all the pips on the left, thereby turning six of the court figures. 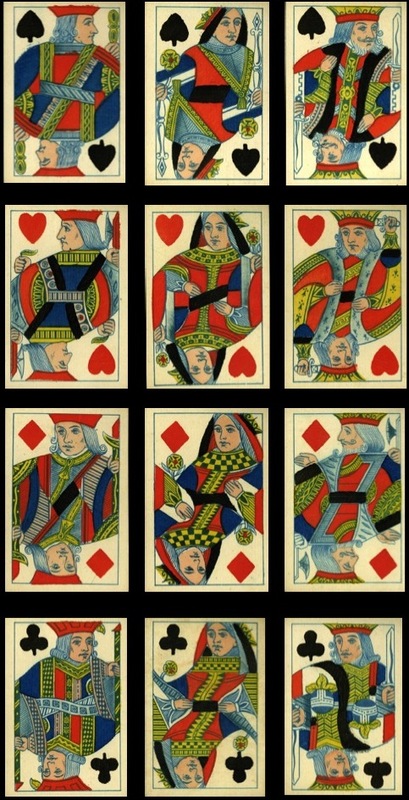 This was done in the Old Frizzle period with cards that were smaller than the norm at that time. 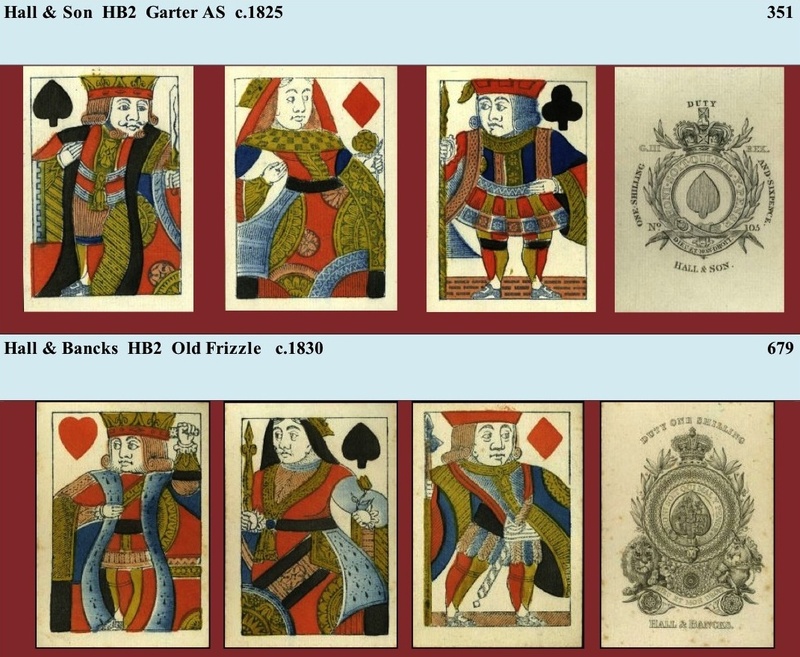 These cards are referred to in an article in The Field from 1866, even though this is after the Old Frizzle period, but one may assume a date of c.1860-62 for their introduction. They also tried an odd kind of indexed pack, which is unlikely to have been a success. It probably dates to the late 1870s. 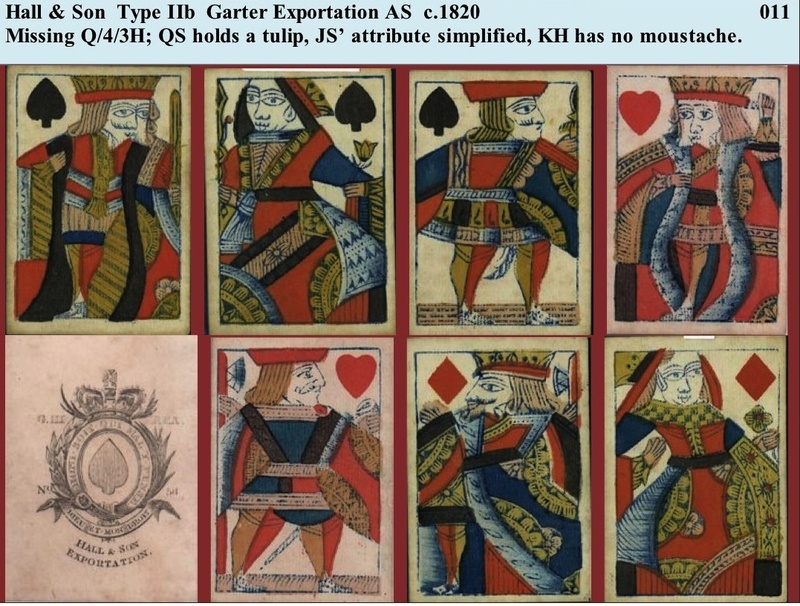 And they even tried a pack with courts in the North German style in the 1850s. 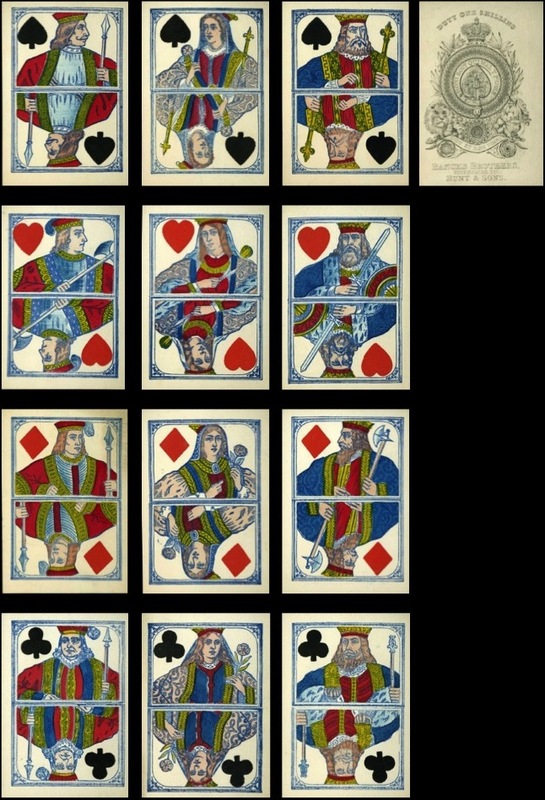 Note that all the pips are on the left. 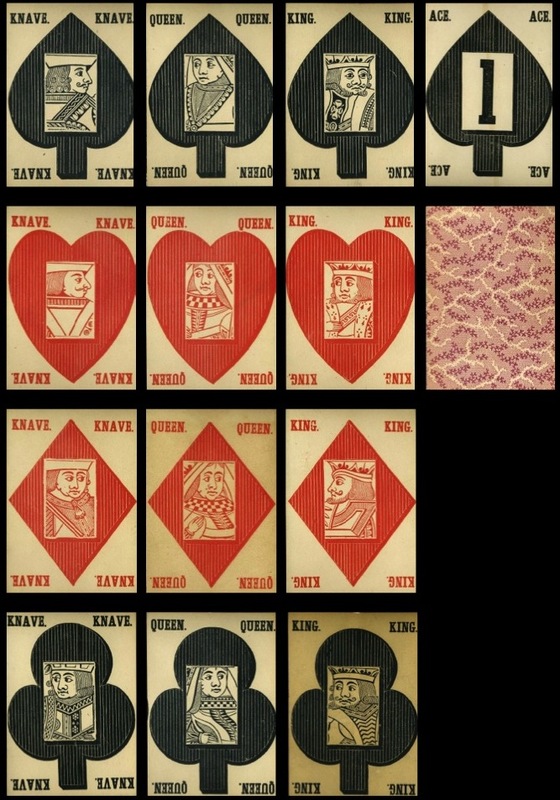 Although it looks like the Belgian-made packs of the time in particular, the postures are those of the standard English courts with some of their attributes moved to make way for the left-hand pips; the KC even holds a turnip-top orb (see the double-ended courts above), as in the normal standard courts, though this is difficult to make out on the scan. Interestingly, Reynolds produced a similar pack about the same time, though theirs looks more authentically German (see page 32). But for whatever reason they lost their share of the market and by 1880, when they introduced new printing methods, it was too late. The courts they produced (HB6) all had their pips on the left, but the queens all face in the same direction, so the design of the QS has had to be modified; the KH has lost a hand.